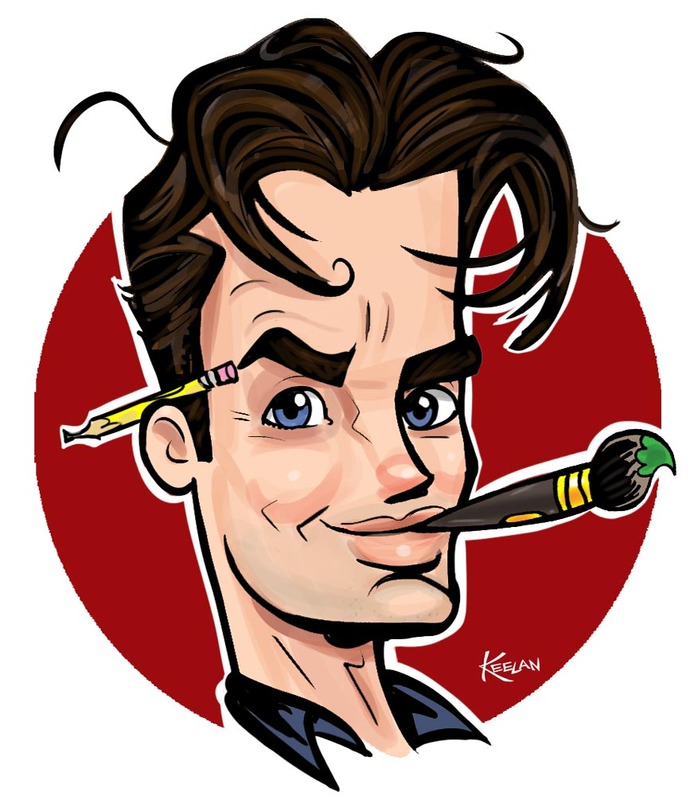 My name is Keelan Parham, and I’ve been a professional cartoonist for over twenty years now, with my work published in comic books, books, magazines, and advertisements. My wife and I own Artistic Talent Group, a Talent Agency that specializes in Live Visual Artists for events, and Caricature Connection, our company that owns and operates caricature concessions at Walt Disney World and other venues. I was past President of the International Society of Caricature Artists, and I’m proud to be a member of the prestigious National Cartoonists’ Society, where I’ve got to personally meet so many of my artistic heroes. Visit this website to keep track of my new work and a peek into the life of a cartoonist. Thanks for stopping by! I ran into your “Tempted” painting. Absolutely loved it. Do you sale prints of it? Thanks, your work is fabulous! Thanks, Janise! No, I’ve never made prints of it. I only have the original. It’s for sale, if you’d like to purchase it, though. Email me at Keelan@cfl.rr.com if interested. How can I contact you for a drawing for a very special little 4 year old boy PLEASE, PLEASE, PLEASE? I can be reached at 407-256-1925 or at my email address. Thank you so much. Great site I’ve ordered your book over the past year I’ve been practicing how to draw caricatures and it not easy even though I’ve been drawing over 40 yrs this is new to me what advice can you help me with Thankyou. Sorry, I just saw this comment! So glad you enjoy the book. Take a sketchbook everywhere with you and practice. Draw, Draw, Draw. Also, find other artists who inspire you and follow them on the internet. OR, better yet, if there are any other artists in your area who draw caricatures, hang out with them. You will push each other to grow! Dino Casterline one of the fastest most prolific artists I’ve ever seen. I quit to go back into construction and ended up at Home Depot for 16 years of steady work. My dream is to be assigned to Gatorland drawing pictures of the people and when there’s downtime drawing cartoon gators and incidental art for the park. I’d like to draw under Caricature Connection’s auspices and methodically turn my wage earner mentality into some real world business acumen.